Very 1920s: Guinness is good for you. Only not as clever. Do I really like it? No. 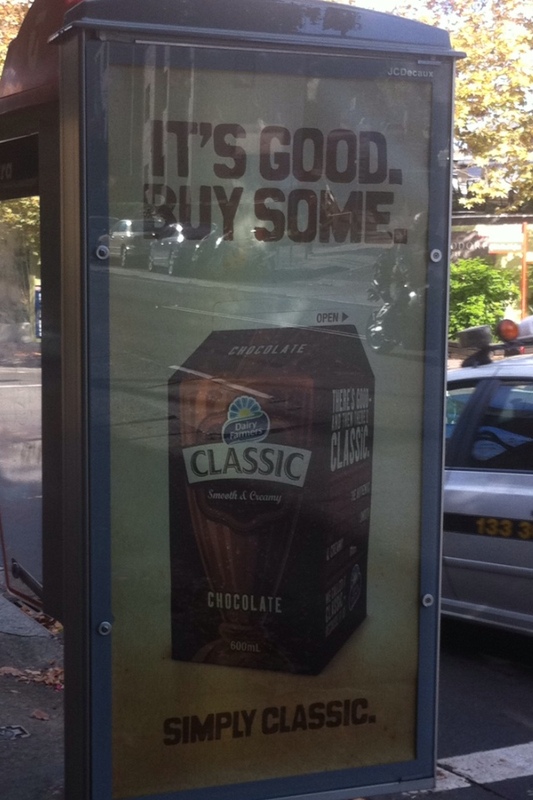 I reckon a packaging design shop created this, not an ad agency. No story being told. But so direct it’s almost funny. Almost. But not quite. I expect it’ll help sales. But not as much as a decent ad would. Insightful – no. Or is it. It’s a milk drink that tastes good. We adv folk over engineer and over think so much advertising. It’s not rocket science, world peace or pretending to solve Pakistani ineptitude in hunting the most wanted man and falling for the oldest trick in the book (hiding right near where the military are as they’ll never think I’m that stupid). I digress – simple ad, works on impulse for me. Matter of fact that’ll do for morning tea today!